Popcorn Pasta?! WTH is she talking about?! This could take many unappealing forms – using popcorn AS pasta and putting sauce on it – which would, of course, melt the yummy part of the popcorn and leave you with a strangely starched and very hull-y red sauce. Yeah, that’s not it. One could also, in theory, put popcorn on your pasta as a topping I suppose, but similar difficulties would ensue unless of course you were using raw pasta in which case I would tell you that nobody who is sober should really chew on raw dried pasta. So what on earth is popcorn pasta, my kids’ new favorite? Popcorn pasta is named thusly only because I season it the SAME way I season popcorn. So you’re about to get a key not only to super easy and yummy pasta but to fantastic popcorn (you know the kind you make in a pot and then put stuff on). Popcorn pasta has 4 ingredients. Yep, I said 4. It is done in approximately 30 seconds longer than it takes to cook your favorite dried pasta, and, in case I haven’t said it, is super yummy. Four ingredients: dried whole wheat pasta (yes, please whole wheat and here’s why OR if you’re a white pasta devotee, still read that bit about why and try a blended pasta to get used to the idea of wheat pasta), olive oil, salt, and nutritional yeast. “As you can guess from its name, nutritional yeast is packed with nutrition, particularly B-vitamins, folic acid, selenium, zinc, and protein. It’s low in fat, is gluten-free (check specific brands for certification), and contains no added sugars or preservatives. Because vitamin B12 is absent from plant foods unless it’s added as a supplement, nutritional yeast that contains B12, such as Red Star Vegetarian Support Formula, is a great addition to the vegan diet (though I strongly recommend taking a supplement as the only way to be sure you’re getting enough). Not all nooch has B12, so check the label carefully before buying. So there you are – good reasons to use nutritional yeast despite it’s terrible name. Two more good reasons: awesome popcorn and Popcorn Pasta. I am only writing this up in recipe form because I am unable to bear the inconsistency that would result from simply describing the procedure (which would admittedly be adequate), now you know something about me you probably didn’t want to know. So here you go, the big finish. Add olive oil to your cooked pasta – enough to make it a little slick, not enough to pool. 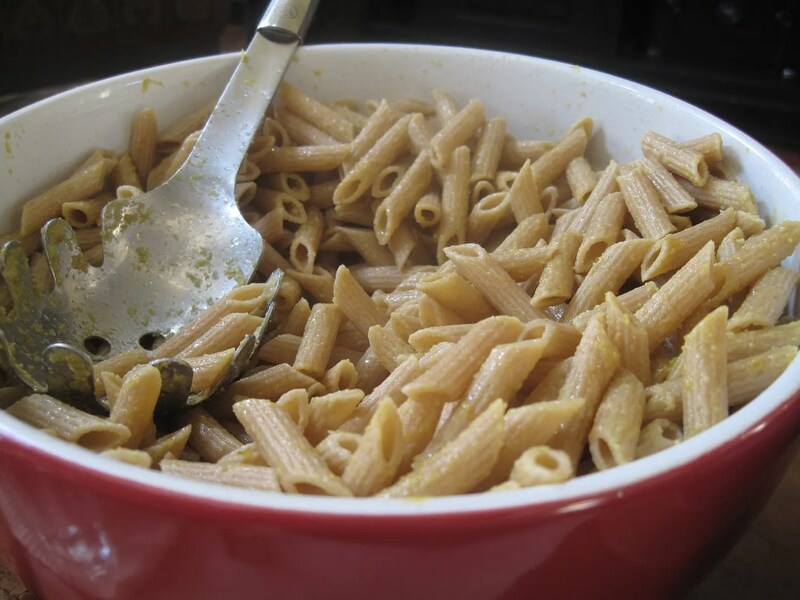 Add generous shakes of nutritional yeast and a teaspoon of salt (adjust for your taste and pasta amount). Stir together – if you have one of these beauties this part is even easier. Taste. Add ingredients as desired. Serve with veggies. Demolish. Delight. Yes, the procedure for super yummy popcorn is the same, although I use a mister for my olive oil in that situation to avoid the aforementioned popcorn mush problem. Eat well, be well friends, even when that means eating things with terrible names. What a fantastic easy, healthy, delicious recipe! I would never have thought of nutritional yeast on the pasta, yet I have in the past, long ago and since forgotten, put it on my popcorn. I am all in! Thank you! You are so welcome. I say it’s for the kids, but I eat it cold from the leftover container. How’s that for a confession?! Totally believable! I will lick the jar from the leftovers, this sauce is SO good! LOL. I’m glad it’s not just me. Ahhh! Now I get it! The name totally makes sense :-)! I enthusiastically recommend this yummy sauce!!! I have been enjoying this high-protein, vegan pasta salad for years, and it’s basically your sauce with onions and herbs, over half pasta half vegetables, with sunflower seeds on top. I’ve also made a plainer sauce exactly like yours, for pasta or rice or vegetables. My son used to call it “trystal yeast” or just call the flakes “trystals” and I like the sound of that. I like your idea of oiling up the pasta and then adding the trystals. I’ve been doing it the other way around, and I suspect that’s why the sauce is so clumpy. I’ll try it your way! Thanks! OH, that pasta salad looks great! ← No! Not a Hummus Recall!